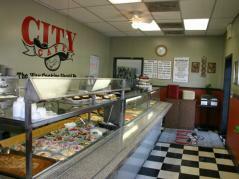 On September 29, 2008 Chef George and his wife, Amy Reed bought City Cafe East on the corner of Lebanon Pike and Spence Lane in Nashville, TN. City Cafe East has been on this corner almost 30 years and the Reeds have definitely improved the established business with their friendly atmosphere and wonderful flavors for their "meat and three" cafeteria style restaurant. They serve every day George's award winning soup, Chicken Tortilla with his famous Cajun Corn Cake, and on rotation, Creole Gumbo and New England Clam Chowder that gives all the others a run for their money. The only sandwich is a grilled Reuben on Chicago Rye with a homemade sauce that is absolutely delicious. George will pull out his big grill and smoke some chicken or beef brisket often. When you see the grill out front, the next day the delicious masterpieces will be available for you to enjoy.